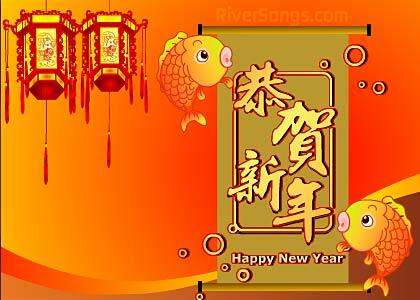 Thank you for choosing RiverSongs Musical Chinese New Year greetings to express your Best Chinese New Year wishes to those you love. The free Chinese New Year ecards are made to share with cell phones, smartphones, Whatsapp, computers & facebook. Users seeing mobile Happy Chinese New Year cards will typically view a musical Chinese New Year video card, while PC Users will view an animated Chinese New Year ecard with music. We hope your 2019 Chinese New Year of the Rooster will be blessed and prosperous! Chinese: 春節, 春节, Chūnjíe; 農曆新年, 农历新年, Nónglì Xīnnián; or 過年, 过年, Guònián, also known as the Lunar New Year or the Spring Festival is the most important of the traditional Chinese holidays. It consists of a period of celebrations, starting on New Year's Day, celebrated on the first day of the first month of the 2019 Chinese calendar.